Dr. Alan Jones, our Research Manager at Earthwatch Institute has been analysing the results of our soil carbon analysis following our spring Earthworm Watch campaign. We can now have a first look at the relationship between earthworm numbers and our soil colour chart which indicates soil carbon content. From the start of Earthworm Watch, one of our aims was to try to understand how soil carbon content might influence earthworm numbers. Earthworms are proven to keep soils healthy - they improve its fertility and ability to store carbon by mixing in dead plant material. Our expectation (or hypothesis) was that areas with higher soil carbon content would have greater numbers of earthworms present. By carrying organic material into the soil earthworms ensure that carbon it contains stays below ground, reducing the amount of carbon dioxide released into the atmosphere. 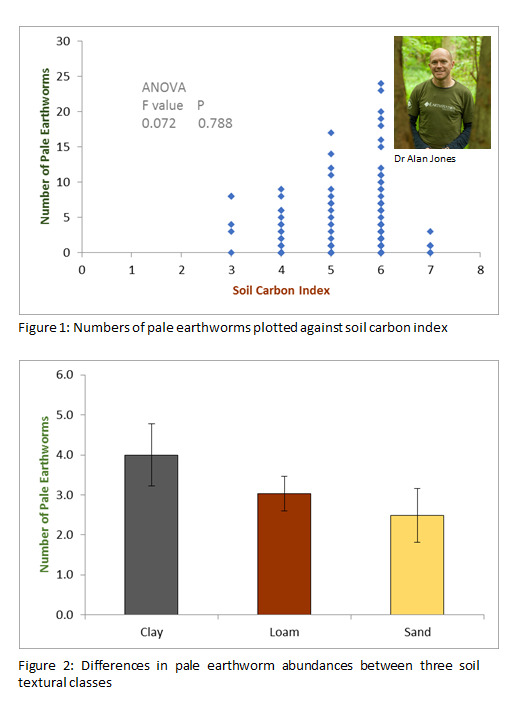 Although there are some interesting results, there does not appear to be a relationship between earthworm numbers and soil carbon content at this stage. To assess the data we used an ANalysis Of VAriance test (or ANOVA), which looks for statistical differences between categories of data. In this case, each of our soil carbon index ‘scores’ is used as an individual category and the ANOVA compares the range of the data points in each category. There were more pale earthworms sampled overall, so we’ll start here. Our initial results suggest that some soil properties may be influencing earthworm abundances – particularly for the pale or soil feeding earthworms that live in the soil surface. Another thing we can look for is whether soil texture influences earthworm numbers. In this instance, we expected (our hypothesis was) that clay soils would hold more earthworms and sandy soils fewer. This is due to the importance of soil texture in regulating soil pH (or its acidity). Clay soils are able to ‘buffer’ the acidity of some soils. We can think of buffering as the soil acting as a ‘sponge’ to mop up acidity. Earthworms are intolerant of soils with a low pH (or high acidity), so clay soils may be better for them. We can see from the data that clay soils do indeed have greater numbers of pale earthworms – which fits with our hypothesis. To analyse this scientifically, however, we also need to consider the range of the data in each of these categories. This variance is shown by the error bars (looking like capital letter “I”) at the top of each column. Because these error bars overlap, there is no statistically significant difference between pale earthworm abundances in each of these soil texture classes. So, it seems that some properties of soil are having an impact on the abundance of earthworm species, such as the pale or soil feeding earthworms that live in the soil surface. To understand this further we need more data. Perhaps as we move into autumn and falling leaves are consumed by earthworms – we might pick up a stronger impression of these relationships. Dr. Alan Jones, is Earthwatch Institute’s Research Manager. His work involves the study of soil carbon how it is stored and moves through our ecosystems and atmosphere through the processes of respiration, decomposition and combustion. Alan’s research at Wytham Woods in collaboration with Oxford University is a long term study focused on using data collected by citizen scientist volunteers work to measure how trees and soils are recycling and storing carbon.